Em is a senior manager in Information Management. 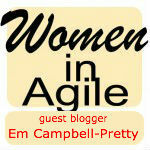 She is a certified Scaled Agile Framework Program Consultant (SPC) and an active member of the Agile community. She frequently speaks about her experiences with Scaling Agile and Agile Data Warehousing at conferences across Australia and the United States. As mentioned in a prior post, the idea for the EDW Agile Release Train came from reading +Dean Leffingwell's Scaling Software Agility. A couple of months after reading the book, there was a restructure and I found myself leading the technology team that I has previously been a customer of. I was eager to pitch the idea of forming an Agile Release Train to my new team, so I arranged a series of workshops with the key leaders across the group. While the "Leffingwell Book Club" (as it was fondly referred to) created the shared understanding that I was eager to achieve, there were some unexpected but positive side effects. First, more book clubs spun up. Our Scrum Masters started with Coaching Agile Teams, our Technical Leads readAgile Analytics, the Test Leads read Agile Testing and one of the feature teams chose to readLean Software Development: An Agile Toolkit. Second, the foundations of what would become our Leadership Continuous Improvement Team emerged as we created a kanban wall to track all the ideas we wanted to implement.